I can remember quite clearly, when I was just beginning to learn playing, how I was perplexed why if I play with a song playing from a record (those days it’s a tape), my guitar’s pitch never matched that of the record. What I did is move my chords up and down the fretboard to match that of a song. Often times it’s very frustrating. It did some help that I was able to learn how to transpose chords early on, but most of the time I cannot get the sound right, like if I sound quite a bit lower than the record and I transpose 1-semitone up I ended up sounding a bit tad higher. 1-semitone is the guitar’s pitch resolution, remember? I cannot go up (or down, if need to) 1/2 semitone. It even made me wonder how the hell those guys writing guitar chords for a song got the correct chords. I must remind I thought myself the guitar; I started by only memorizing chords. I didn’t even know that time the individual strings has a name! I just call and remember the strings by number, being #1 the “treble E”, and #6 the “bass E”. Hell I only have a simple chord chart to start with. What I did was if the chords started sounding somewhat odd, I looked for somebody who can “tune” for me. It went on for a few months. Until I came to know that the guitar has to be tuned to a known standard. Until then, tuning a guitar for me means only making the string sound harmonized with each other, to avoid what we call “sintunado” (out of tune, or out of harmony). It so happened that those older guys tuning it for me, don’t care about the guitar’s pitch at all. Those guys play in different tuning actually, they call it “kundiman”, and it’s very localized in the northern part of the Philippines. You probably can’t find any documentation about it, but it’s very well for playing Filipino Kundiman, and the guitar sound being quite loose on the bass that it’s often times “slapped” against the fretboard. So I was told: tune to standard. That set me off, asking people what standard, until I found somebody who’s really guitar literate, and shown me a tuner. Ha! The standard. Things changed eversince. And few days ago, someone asked me, why even if he followed the chords in the chord listing of a song, he’s always not in-pitch with the record. I must say he’s a beginner. He emailed me a copy of the song he’s trying to pla, I tried, played with a reference in YouTube, and yes as expected: off-pitch. This is what this post is for. First thing before you play: tune your guitar. First off, you need to know the name of strings. The "fattest" string is called E, the next fattest is A, etc. So we have E, A, D, G, B, E. I don't want you to memorize so many things, but you have to remember the string names. To make it easier, you can build a phrase like Every-Adult-Dog-Goes-Barking-Everywhere. You would tune to these notes. 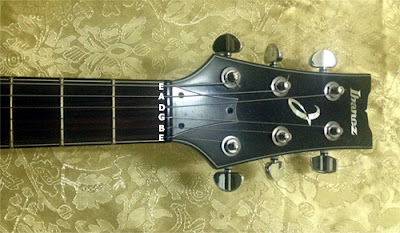 Guitar tuners' readouts will tell you exactly, say the fattest string, E or Eb or E#. Can you recall the # and b in previous tutorials? # is 1/2 note higher, and b is 1/2 note lower. That's exactly what guitar tuners do for you, tell you if the string is lower or higher than it should be. By that you'd know if you need to tighten or loosen a string. Take time to memorize the string names. 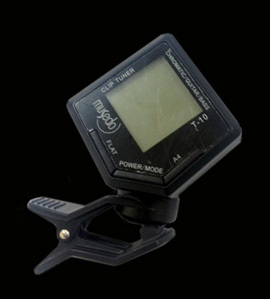 There are multitude of electronic tuners, I personally use the Musedo T10 shown below. You can search the internet for other examples like Yamaha YT-150 and Cherub WST550G. A musical note corresponds to specific frequency of vibration. Electronic tuners measure the frequency of vibration of the strings and tells you whether it's lower and higher than it should be, from there you decide whether to tighten or loosen strings. Here you can see the Musedo T10 in use, while I'm tuning the E string of a bass guitar ( the strings of the bass guitar are E-A-D-G, same as the upper 4 strings of the guitar ). If you notice, there is a pointer pointing directly vertical, it means the string I am "measuring" is exactly E. The pointer swings to the left if the string is lower than E, and to the right if the string is upper of E.
Personally, I prefer clip-type tuners because I can tune acoustic guitars with ease. The Musedo T10 and Cherub WST550G are clip-type tuners. The Yamaha YT-150 tuner has "mic" mode, where it picks the sound via a microphone then measure the frequency. 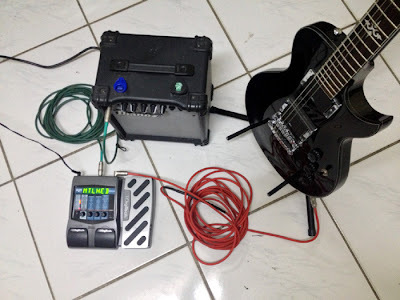 Of course you can use it to tune acoustic guitars, but you'll have a problem in noisy environment, like live stage performances; it has an input though, which is the best in the reliability spectrum, but means your acoustic guitar should have a pick-up. If you're playing an acoustic on stage trough a P/A microphone, you'll have problem. Now, this is in the expensive end. Chances are you will not be aiming to have this kind of tuning early on, but I am including it for completeness, and you'll be having it eventually anyway. 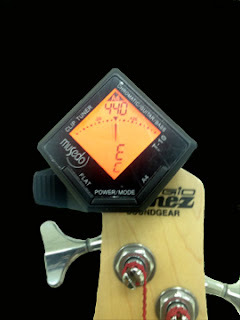 Professional musicians favor these kind of tuners, one reason is because of their availability - the guitar is plugged in them already, so tuning is a breeze. It affords real time check on-stage. Second why it's favored, is because of accuracy. 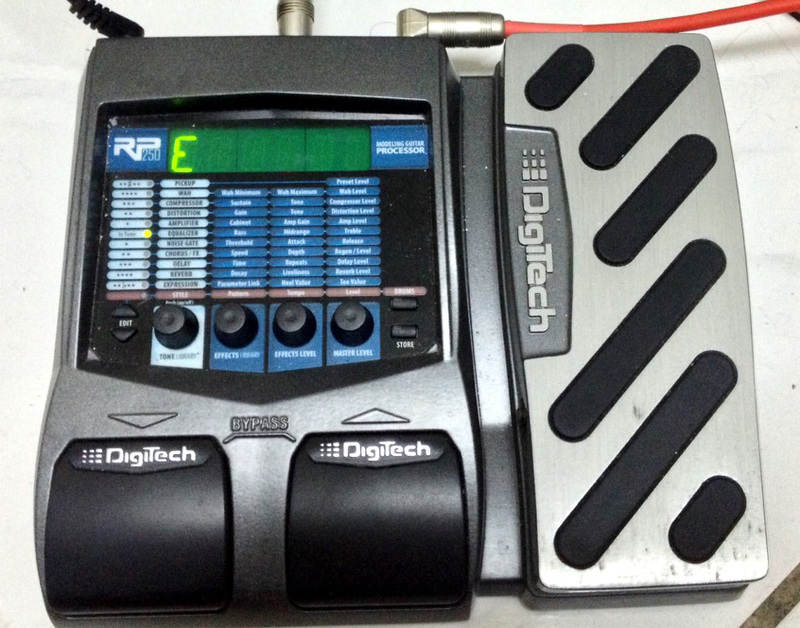 Compared to portable electronics costing few bucks, effects processors' processors are way much powerful hence offers better accuracy. An example of an effects processor is Digitech's RP250. Shown here is a practice rig with RP250 as the effects processor. And here is the RP250 in the tuner mode. The picture is taken while I am tuning the fat E string; the led on the left either moves up or down, depending if my string's pitch is higher or lower than E correspondingly. Guitar amplifiers, like Line6 Spider series amps has built in tuners. I don't have one but you can read more here. Needless to say, it's a great advantage to have this on stage. This is by far the simplest way to tune a guitar. Compare the string's pitches with online references, like 8notes.com, fender's or gibson's online guitar tuners. Tuning this way will take practice though, you will need to try several times until your ears get used to it. But it's free, as long as you have internet connection. I figure many beginners will settle for this way of tuning initially. One disadvantage of this way of tuning is of course you won't be able to use it on stage, but for beginners, it's a good way to start. The ear training you'll get is definitely a big advantage. 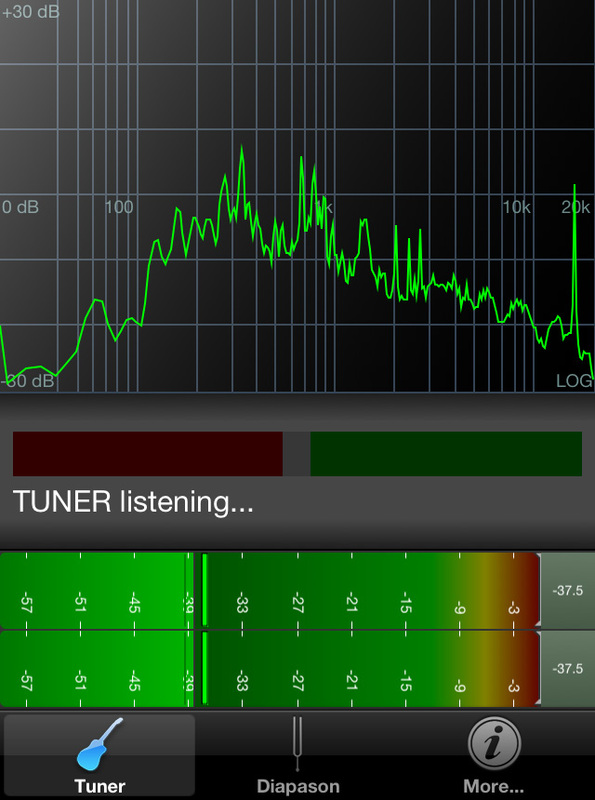 I personally use n-Track Tuner on iPhone. The app is free and usage is simple. The red bar in the middle-left is saying my string needed to be tightened a bit; if it turns green, and moved to the right bar, it means I need to loosen a bit. An exact E will show a white bar in between the red and green bars. Pretty simple. I cannot use this on-stage of course. 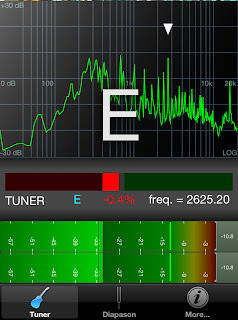 But to beginners out there, this method is a very cost effective and reliable way of tuning. Just find a quiet place and presto. 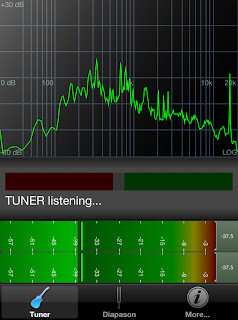 I'm sure there are other free tuners in Apple's Apps Store, and surely there are counterparts for Android phones. Be careful. The strings can withstand tremendous tension but they aren't unbreakable. The strings will break if over tightened. Problem is, it could possibly whip you in the face, much worse, in the eyes. Do this: whenever you're tightening a string grab the neck as shown. So there, tune your guitar to "standard", then fire away!